If you look back on the past two years I’ve been doing this, you’ll see a lot of cakes, some cookies, breads, and pies, and (especially at the beginning) a good number of savory dishes as well. Other than the occasional batch of truffles (to use up excess heavy cream), what you won’t see much of is confectionery. Although the Africano does have a thin bit of cake in it, it is far more confection than cake, which I think makes it the first thing I’ve done in that category that isn’t a straight-out truffle. The recipe comes from Palermo, Italy, by way of Rosetta Costantino’s Southern Italian Desserts (Ten Speed Press, 2013; pp.&nbsp.33–35). It’s a fairly complicated thing to make, but complicated in a way that’s more tedious than difficult — much of the preparation time is spent waiting for chocolate to reach the proper temperature, or to resolidify after having been melted. 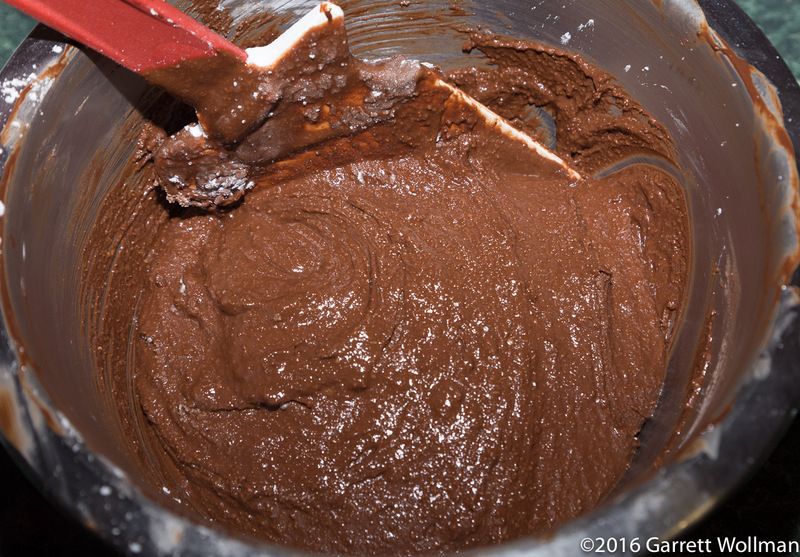 I started out by making hazelnut paste (pasta di nocciola). This does exist as a store-bought ingredient (I’m sure you can find it on Amazon), but since it’s nothing more than ground, dark-toasted hazelnuts, I figured I might as well save myself the expense and do it at home. However, I didn’t want to deal with the hassle of blanching hazelnuts myself, so I bought my hazelnuts pre-blanched. The recipe for homemade hazelnut paste calls for a pound, but the recipe for Africani calls for only a cup (240 g), so I had some left over — Costantino includes a recipe for chocolate hazelnut paste (think Nutella but without the added palm oil), so I made that too — and just ate what was left over. I did this a few days before making the Africani, and stored the paste in an airtight container in the refrigerator until I was ready for it. As I mentioned, there is a thin bit of cake inside this confection. 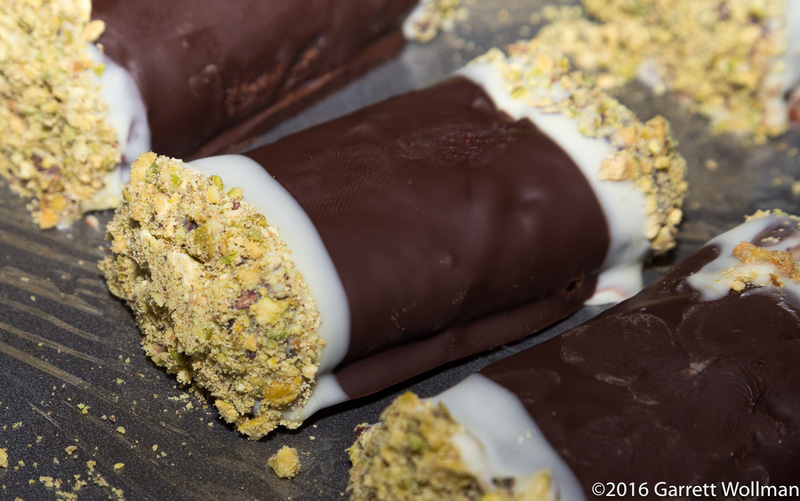 The basic construction is a chocolate-hazelnut center, wrapped in a thin layer of cake, enrobed in dark chocolate, then dipped in white couverture and chopped pistachios. The center is made from 255 g of melted semisweet chocolate — I used Callebaut 54% as the recipe specified 55% cacao, max — and the 240 g of hazelnut paste made previously, along with 125 g of confectioner’s sugar. The cake is made from three eggs, three tablespoons of sugar, two teaspoons of honey, and 50 g of cake flour. 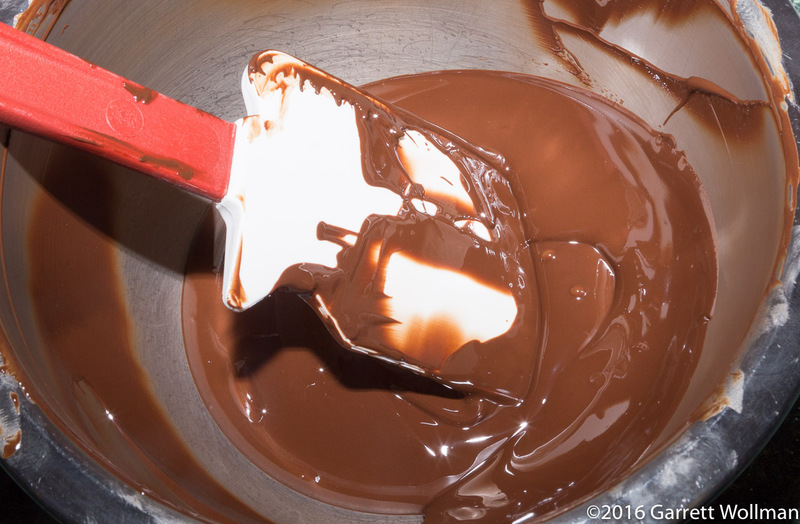 Normally I would just use the microwave for melting chocolate, but in this case I knew that I would (in a later stage) need to keep my melted chocolate warm and fluid, so I set up a small double boiler on the stovetop and used that for all of my chocolate-melting. After mixing the melted semisweet chocolate and hazelnut paste together, the center of the Africano must cool until spreadable. As it turned out, I probably didn’t wait long enough, and had a great deal of difficulty rolling my Africani out evenly without losing half of the filling. Oh, look, it’s a cake made from an egg foam! 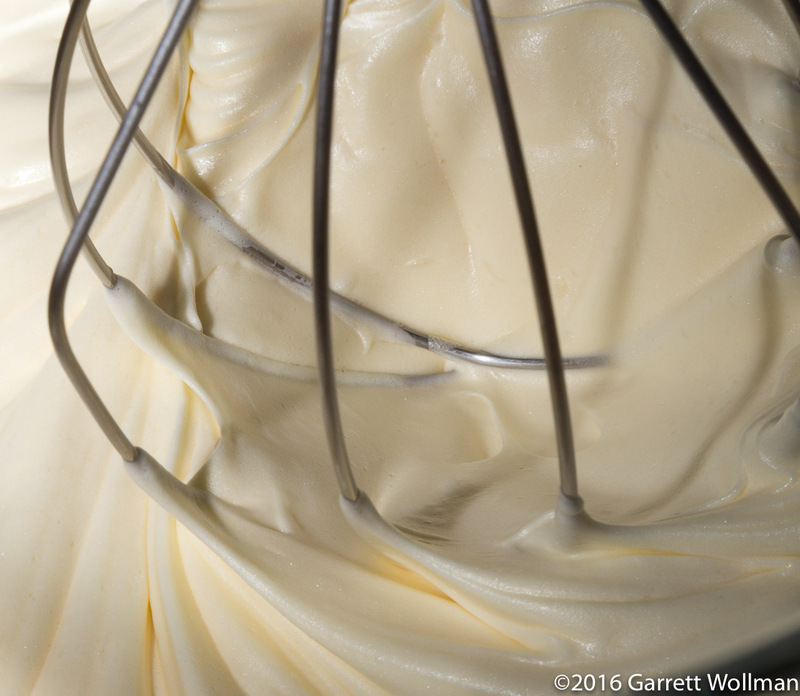 This is the modified genoise method: the whole eggs and sweeteners are whipped together for a long time (15 minutes per the recipe), and then the flour is folded in carefully. Again I was foiled somewhat by the deep work bowl of my mixer, which makes it difficult to ensure that the flour is evenly mixed into the eggs rather than accumulating in the divot at the bottom where it’s hard to scrape up. The cake batter is spread evenly in a parchment-lined half-sheet pan and baked in a 350°F (175°C) oven until golden and set, about 10 minutes. While it is still warm and pliable, the cake is removed from the pan, trimmed, cut into four strips widthwise, and flipped over. 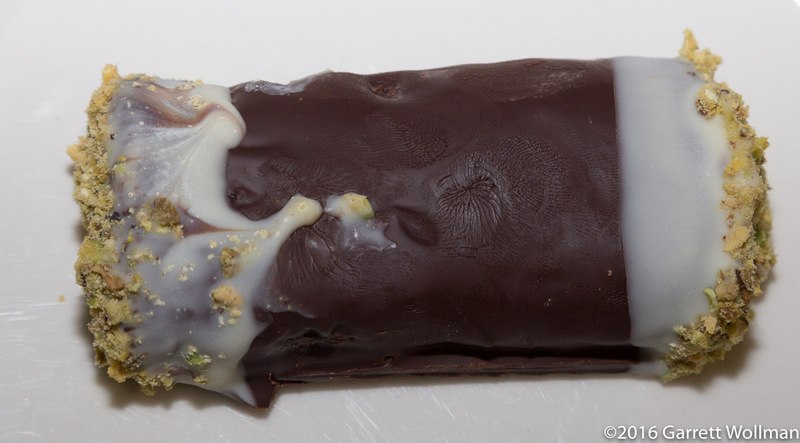 Then the chocolate-hazelnut filling is divided equally among the four strips, which are rolled up parallel to the long edge. The filling recipe yields 620 g of filling, but I ended up only being able to use 545 g of it, and even then my rolls ended up a bit squat and leaky (hence the need for more cooling of the filling). 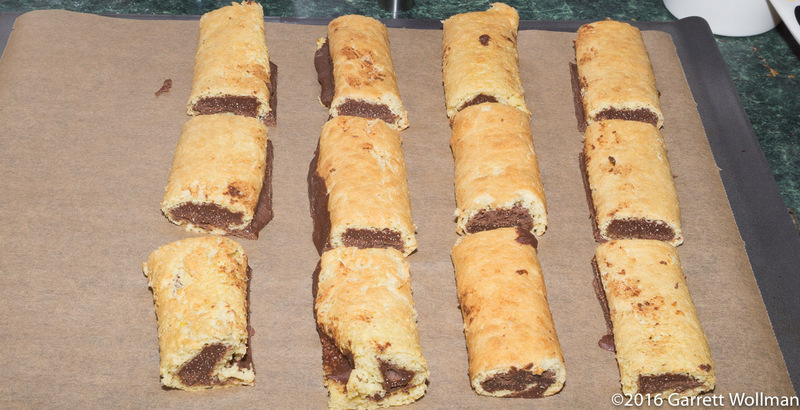 The filled cake rolls are refrigerated until the filling is completely set, 15–30 minutes. The next step is to enrobe the rolls in more chocolate. The recipe calls for 55–60% chocolate here, which seems not appreciably different from the chocolate used in the filling; I used a mixture of the leftover Callebaut 54% couverture from the filling and some Callebaut 57% “callets” that I recently started seeing at Whole Foods. After enrobing, the Africani go back in the fridge for another half an hour to set the coating, then are dipped in melted white couverture and chopped pistachios to cover the ends. 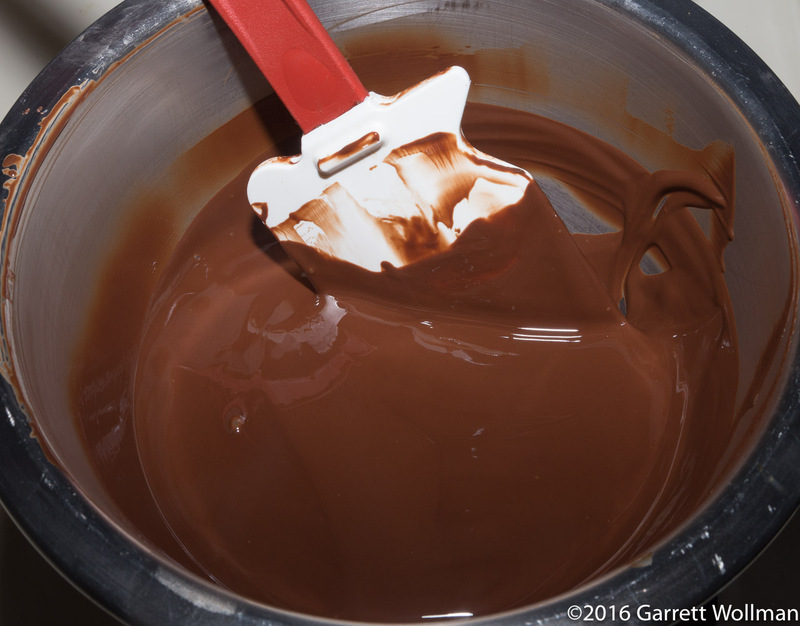 The nature of this process is such that you have to prepare more chocolate than actually ends up in the final confections; the leftovers can be used to coat other things, or you can just let the chocolate solidify and then eat it. I had 100 g of melted white couverture left over, 15 g of pistachios, and 180 g of the mixed dark couverture. The final product looks impressive, and most of my tasters thought I did a lot more work than I actually did. However, I did get a few comments from people who preferred the cakes I have been doing recently to this dessert. Speaking for myself, I quite liked it, but the process of preparation is tedious enough that I’m not sure I’d repeat it. Perhaps for a party, should I ever be in the position of holding one — in which case I’d definitely go for smaller portions. The analysis for these figures reflects the amount of leftover filling and couverture noted above, but does not reflect the amounts of cake and filling removed in trimming and portioning. This entry was posted in Food and tagged cake roll, chocolate, reecipe, Rosetta Costantino. Bookmark the permalink.